Ireland fended off a relentless late onslaught to grind past Australia 26-23 despite being outscored three tries to two in Dublin. Joe Schmidt's men completed their first autumn Test series clean sweep since 2006 thanks to tries from Simon Zebo and Tommy Bowe and Johnny Sexton's 16 points. Australia scrum-half Nick Phipps crossed twice with Bernard Foley claiming a third score for the visitors, but Ireland somehow held firm under huge final-quarter pressure. 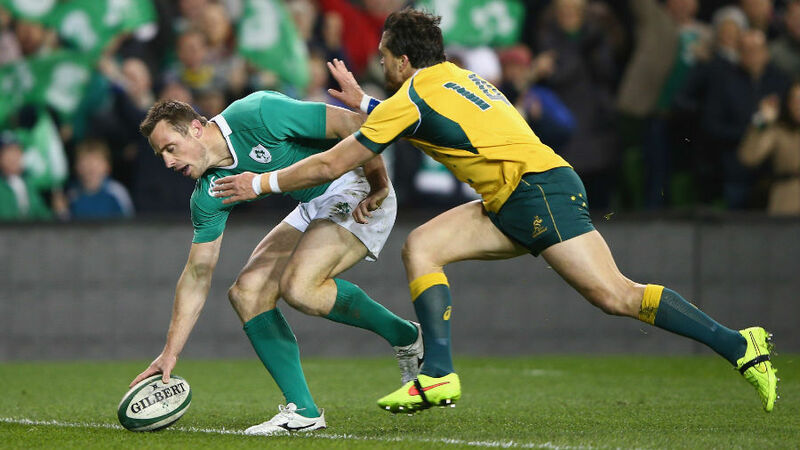 Ireland atoned for last year's 32-15 defeat to Australia in combative style, refusing to relent at the death. Last November head coach Schmidt's side were unable to hold out at the last, losing out 24-22 to New Zealand in the game's very final play. This year there were to be no last-ditch capitulations, with Ireland building on their 29-15 victory over South Africa in resolute style. Ireland tiptoed ahead of Australia into third place in the world rankings last weekend: now they have proved themselves truly worth of their highest global rating for eight years. Sexton landed one of two early chances at goal to ease the hosts into an early first-half lead before teeing up the game's opening try. Best robbed the ball after a trademark Ireland choke tackle, and Sexton's prescient kick in behind the defence allowed Zebo to win the foot race and slide home. Racing Metro playmaker Sexton's conversion pushed Ireland into a 10-0 lead, with the crowd chanting Munster flyer Zebo's name in delight. Australia's immediate riposte led to clean line breaks for Bernard Foley and Tevita Kuridrani, but the lurking Tommy Bowe cut their break dead with a keen-eyed interception. The Ulster wing then raced the length of the field to score and cement Ireland's hugely impressive start, with Sexton again adding the extras for a 17-0 home advantage. The blistering start continued unabated when Australia clawed back a try, Nick Phipps profiting from Zebo's intercepted pass to hare home and Foley's conversion cutting the deficit to 10 points. Australia hustled Gordon D'Arcy in Ireland's 22, forcing Conor Murray into a loose pass that Sexton hurriedly punted out, handing the Wallabies an attacking lineout deep in home territory. Kearney made a try-saving tackle on debutant Speight after Foley's accurate crossfield chip, before the Wallabies fly-half stole home amid controversy. Phipps' scoring pass to Foley appeared decidedly forward, but the French television match official (TMO) Eric Gauzins still awarded the try. Australia fly-half Foley missed the conversion to leave Ireland leading 17-12. Ireland wasted territorial advantage when poor support forced Kearney into conceding a penalty for holding on. When Australia countered at pace, Matt Toomua's flicked inside pass set Foley away, with the fly-half in turn sending in half-back partner Phipps for his second try. Foley's second missed conversion left the scores locked at 17-17, despite the visitors leading the try count three to two. Australia's resurgence rattled Ireland and rendered their defensive shape at best bedraggled, and Foley's penalty wrestled the visitors into the lead for the first time. Israel Folau then batted away Sexton's crossfield chip, but a penalty advantage allowed the Racing fly-half to level the scores with his second successful kick. Yet more breathless fare met the resumption, Zebo spilling a routine pass and Phipps knocking on in sweeping up Sexton's threatening chip. Sexton posted his third penalty before Foley responded with one of his own, Rhys Ruddock admonished for slipping his bind at the scrum. Ruddock's misdemeanour underscored Mike Ross' gritty scrum battle with Wallabies prop James Slipper, the flanker ill-advisedly moving to his tighthead's aid. Ian Madigan replaced Gordon D'Arcy after the Leinster centre suffered a heavy blow to the head, with the teams still locked at 23-23 on the hour. A monster scrummage from Ireland and a pinpoint Sexton punt into the corner heaped the pressure right back on Australia. The Wallabies cleared straight to Kearney and the full-back launched an ambitious drop-goal attempt from long range which rebounded off the right-hand post allowing Australia to clear. Sexton's fourth penalty of the night then edged Ireland back into a three-point lead. Australia duly pegged Ireland back into their half for the remaining 16 minutes but unlike in times past, this gritty group held out.